I’m just about to head to bed so I can get up and be at the precinct at 6am for tomorrow’s runoff election. While I know there are only 2 races on the ballot in Durham county, I still encourage everyone to go out and vote. It won’t take that long and you’ll have your say in who will be on the school board and who will be the NC Commissioner of Labor. If we really want a democracy, then we need to work at it. After all, we wouldn’t want to end up like Zimbabwe is right now where the opposition candidate has pulled out of a runoff election and is in hiding in the Dutch embassy! So, please come out and vote tomorrow. 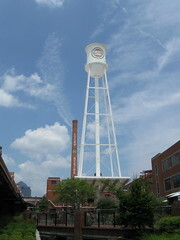 I got a new camera about 2 weeks ago and had lunch at Tylers at the American Tobacco Campus last Sunday. Afterwards, I had to take a few pictures because it was so nice outside. This was probably the best of the ones I took.